The former Editor-in Chief of Essence magazine, Angela Burt-Murrary’s new novel takes readers inside the high-stakes world of professional basketball—where everyone plays to win. In GAMES DIVAS PLAY, the first book in the Diva Mystery Series, Burt-Murray introduces an ambitious entertainment reporter battling backstabbing colleagues and reeling from murderous threats, the desperate wife of NBA star Marcus King, who’s as popular with the ladies as he is with hoops fans, and a scandalous groupie shopping a reality show based on her affair with Marcus. These three women soon learn what it really takes to stay on top when they engage in a ruthless battle for love and the limelight. 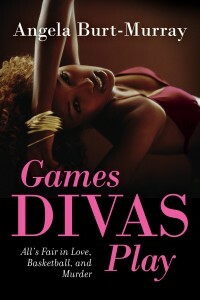 GAMES DIVAS PLAY is a juicy, gossipy, and flat-out fun read; James Patterson meets Real Housewives of Atlanta. Angela Burt-Murray is the cofounder and editorial director of Cocoa Media Group, cohost of the talk show Exhale, and coauthor of two previous books, The Vow and The Angry Black Woman’s Guide to Life. She was formerly the editor-in-chief of Essence magazine, where she was the recipient of numerous honors. Her work is regularly featured in such publications as Ebony, Parenting, and Heart & Soul. She lives in Atlanta with her husband and two sons. It’s not often that you come across a mystery that is also funny and sassy, but Games Divas Play is all three. From the very first page, the reader is thrust into the action, witnessing a murder in progress, and from there, the three women at the core of the novel, Nia, Vanessa, and Laila, take us on a fast-paced journey that feels like you’re riding a roller-coaster and shopping for designer shoes at the same time. I have to confess that Nia was my favorite character, possibly because when I’m not doing book reviews, I interview a lot of celebrities for my day job, and I know how hard it is to build trustworthy connections with publicists, agents, and managers. That said, Vanessa and Laila were no less interesting, and no less dimensional. These women were all people you could easily run into during your life. Similarly the supporting characters were well-rounded and believable, though my favorite was the fabulous MJ, Nia’s flamingly gay assistant. With this character author Burt-Murray stays just this side of caricature, and I know this to be true, because I’ve worked with versions of MJ for most of my life. The plot of the novel, especially the mystery, was well-crafted, with a nice balance of information, action, and intrigue. I was kept guessing til the very end, which I found to be satisfying in every way. This novel is the first in a series, and I’m looking forward to finding out what happens in the next book. Goes well with Cocktails and coconut shrimp. This review is part of a blog tour hosted by TLC Book Tours, who provided me with an ARC of the novel in exchange for my review. For more information, and to see the entire list of tour stops, visit the tour page by clicking HERE.